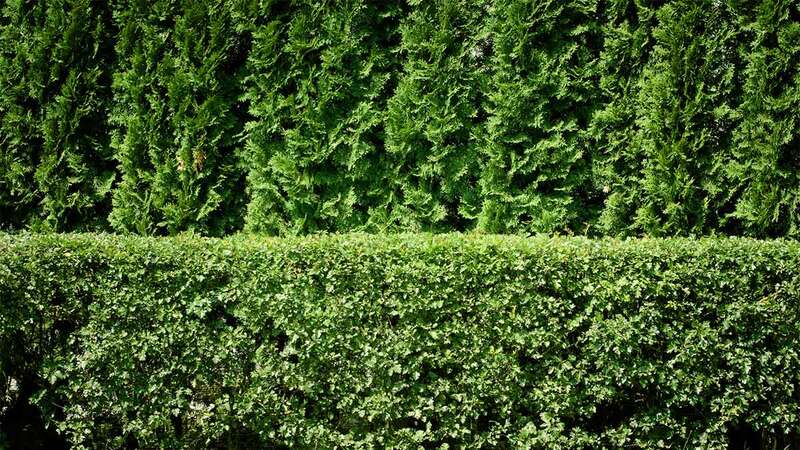 Learn how to plant a privacy hedge in 8 simple steps. Privacy screens like all hedges can serve several purposes and can add value to many different types of property. Evergreens are great for reducing noise, reducing snow, and screening all year long. Deciduous Trees offer a wider variety of landscaping elements including spring flowers or fall colors but do not provide a year round screen. Determine how high you want your screen. Put a ladder or have someone stand where you are considering placing the hedge, this will let you visually see how high you want your screen. After figuring out your main reason for planting and how high you want your hedge, the next step is to determine how much space you have available. If you have a large amount of space available you may consider making a double or triple row. If the space is tight you may consider the following trees or shrubs. Planting in rows close together trees and shrubs will not spread out as wide as if they were a single species in a landscape. American Arborvitae will grow up to 15' wide in the wild but can trim shorter in a hedge setting and due to close planting proximity will greatly reduce overall width. North Privet grows 4' to 6' wide in the wild but can be trimmed to more compact widths. Now that you know why you are planting a hedge, how much space you have, and how tall you want your screen; you can select a plant. Check out the hedge overview in Step 2 to compare popular hedges. The amount of space you have and how dense you want your screen will determine the number of rows you plant. Spacing between rows is based on crown width, but at a minimum try to avoid root crowding by setting at least 12" to 24" apart measuring from the center of the plant. Spacing will depend on the type of shrub or tree you are planting and how close you want them at maturity. Again, at a minimum try to avoid root crowding by setting at least 12-24 inches apart measuring from the center of the plant. Also remember by planting trees and shrubs in rows close together they will not spread out as wide as if they were a standalone tree or shrub. Once you have picked out your plants you are now ready to map out the location of your plants. You can do this by putting wooden stakes in the ground at each end and tie a string between them. This will make sure you have a straight row or rows. Based upon the amount of space you have determined from Step 5, place a sprinkler flag or other marker along the string. (Example: You determined that 24 inches is the amount appropriate for your plan and plants. You would then place a sprinkler flag at 24 inches, 48 inches, 72 inches, and so on. For hedges, it is best to dig a straight trench when planting bare root shrubs. For containerized plants, individual holes work best. However, either method can be used. Follow our handy tree planting videos to learn how to plant your tree or shrub privacy hedge. Start training your shrubs after it is established and growing vigorously. Generally this takes 1-2 seasons after planting. To train as a hedge, trim top and sides a few times per year as necessary, removing about one-half the length of new shoots. Most needled evergreens make their growth early in the season, while most broadleaf evergreens and deciduous plants grow over a longer period of time. Ideal hedge shapes are wider at the base than the top, to allow sunlight to reach the lower leaves. Training a tree like a juniper, cedar, or pine is not recommended. If you are using a tree to create a hedge or screen, it is best to allow them to grow naturally and follow good pruning techniques.